Have you ever considered shaving as a form of art? It is an art that requires perfection with not only experience, but with expert tools! To truly attain the artistic level of shaving, you need something more than just your everyday razor. The Japanese straight razor is that amazing razor for next level shaving. Japanese shaving razors allow the closest, cleanest, and smoothest shave with an amazingly easy tool – the straight razor. Worldwide, men are commonly using the traditional razor but a select few enjoy the true advantages of Japanese straight razors. These razors are made of high-quality materials for excellent performance and for great value for money. A traditional straight razor is not easy to use, but once you try it – that’s all you would want to use. There are numerous varieties of straight razors in the market. Today, we will review some of the best Japanese straight razors for quality, performance and reliability. We will make easy for you the hard task of choosing the right straight razor among the many and share the advantages of using the best five in the market. 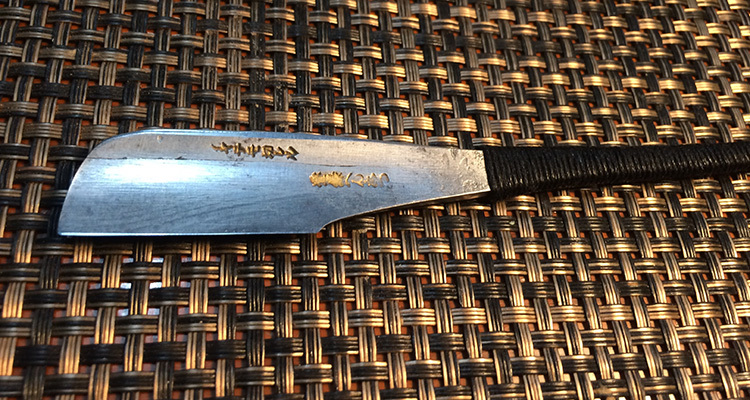 What characteristics will you look when buying a best japanese straight razor? Feather is big name in the straight razor industry. The SS Japanese Straight Razor by Feather is supreme engineered product which comes in a slick black color. Feather is known to create some of the most innovative designs and this is no different. It comes in a resin handle which has excellent grip and is heat resistant to handle up to 275 Fahrenheits. Feather SS Japanese Straight Razor uses replaceable blades making it both hygienic and low maintenance. As a replaceable blade straight razor, it saves you the trouble of honing and stropping it for use. It may seem like a downside that you will be restricted to using just Feather Artist Club replacement blades, but it ensures quality performance. The stainless-steel shank makes it a very durable product for the long run. 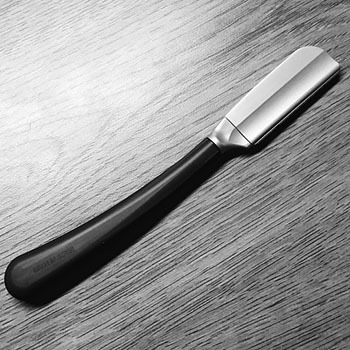 The simplistic design of the Feather SS Japanese Straight Razor is just classic. Its head is rounded and the blade is wide to allow a lot of exposure. The resin handle makes it comfortable to grip for a great shave. It may not look like much but you will feel the subtle design aspects which makes it a top-quality product. The Feather SS is an exported product from Japan. It is knowns as “the most innovative razor in the world” due to its effective yet, simplistic design. It is engineered to perform and the handle is water resistant for a comfortable hold. From its feel in your hands, to the shave you get, you will be impressed throughout. If you want a completely unique shaving experience – this is how you get it! Feather SS Japanese Straight Razor is small in size, light in weight and the blades are easily replaceable. All qualities which are perfect for both novice and expert straight shavers. The high-quality materials used for manufacturing this straight razor provides the closest shaves. As a beginner, I absolutely enjoyed my first experience with it. A point of concern is that the razor is extremely compact in size. For those with larger hands or who may be a bit clumsy with their hands may have some difficulties. 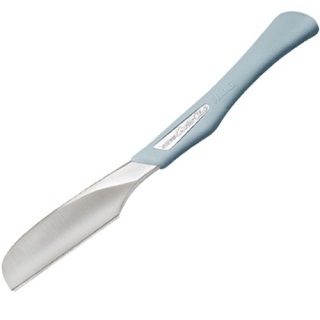 Also, you cannot simply use any blade as a replacement; it must be a Feather Artist Club replacement blade. The Naked Armor straight shaving razor kit is approved as a professional barber kit for men. It is equipped with genuine Japanese steel blade which is honed for perfection. You will get the best shave with this Japanese straight razor after just one quick strop. It comes in a complete kit within the box. Naked Armor backs its product with a guaranteed satisfaction warranty. It offers a full refund for those who are not happy with it, no questions asked! Without a doubt, straight razors are guaranteed to provide exceptional shaving experiences. It is all about overcoming the initial learning curve to train yourself. After that, using a straight razor such as the Naked Armor with its exceptionally long blade will be effortless to handle by anyone. As a beginner, I had absolutely no trouble using it! Once you get used to holding it, of course as most people are used to holding the standard razors, it is much easier to use. Other than extra amount of time, care and concentration needed in using a Japanese straight razor, not just the Naked Armor, there is really nothing to lose. As always… practice will make a perfect straight shaver out of you! The Naked Armor Japanese straight shaving razor is an all-round kit experience but the sharpness of the blade itself is not as sharp as most other straight razor blades. The kit includes strops to sharpen the blade however, it is not ideal for an expert user. The SS Folding Handle Razor by Feather comes in an attractive black color. Like the Feather SS, it too is exceptionally engineered with an amazing resin handle. The heat resistant gum handle is easy to grip and comfortable to use. It is also a replaceable blade straight razor with a standard 4.8-inch handle. 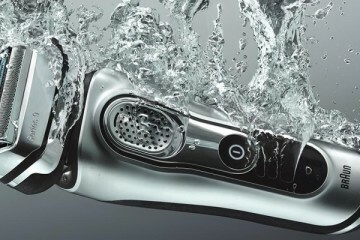 The body of the SS Folding Handle Razor is made of stainless steel. 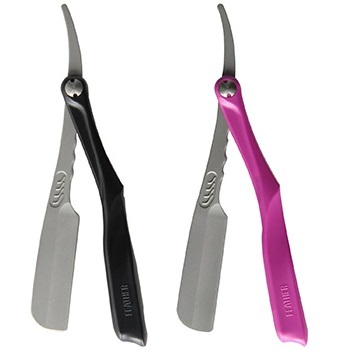 It allows smooth shaving and is built with a rounded head. This gives the blade optimal exposure for soft, smooth and a safe shaving experience. 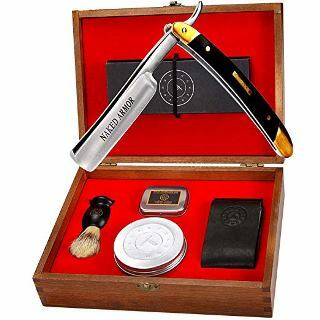 It is built with the specific purpose of making every day shaving with a straight razor easier and more comfortable for all. Replacing the blades is as simple as pinching the blade and it automatically comes out as it is spring mounted. The folding makes it easy to store and safe to handle. Also, cleaning the SS Folding Handle Razor is simple. The head can be easily dismantled and cleaned using water directly, and it can be disinfected by either boiling water or ethanol. The handle can easily deal with boiling temperatures. It is barbers’ and professionally recommended tool for men. Feather is a razor manufacturing company which is associated with quality products. The SS Folding Handle Razor is proof of its well-thought out, crafty designs for shaving equipment. The foldable design is for easy & safe storage. The blade replacement is simple and backed by the support of any Feather series blade. I find it to be an extremely user-friendly design, especially for beginners. SS Folding Handle Razor comes with Feather’s high endurance, heat resistant handle which is not only water resistant but also resistant to corrosion. The close shave, the easy blade replacement and the safe storage on offer by the SS Folding Handle Razor makes it sought after straight razor. On top of this, the performance is not compromised and is of the highest quality. There are really no concerns or shortcomings of the SS Folding Handle Razor. If one can be mentioned, it is the inability for the razor to support any blade as a replacement. It is restricted to using blades by the Feather series only. The A. P. Donovan straight razor is a high-quality tool which offers a thorough shaving experience. It uses high-quality alloy, the Japanese steel – Shirogami steel. This amazing carbon steel is capable of delivering extremely sharp blades. The gold etching logo on the blade is pressure applied to reflect its premium quality. The design is completed by hand crafted handle designed on mahogany wood from the Madagascar forests. 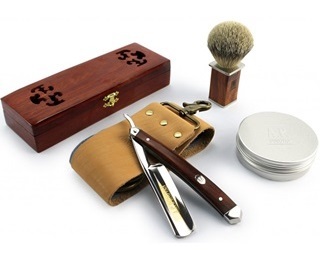 Every A. P. Donovan razor comes in a trademark decorative, wooden box. This gives the premium product a noble character as a gift. The box is not limited to being a nice decorative gift box, but a practical one for safe storage and transport. It comes with a brush which is created with hair from Badger. The leather strap is made with Kazakh cow skin in addition to linen fabric. A product which is last many years of use. This premium straight razor is an excellent creation of both quality, style and practicality. It is safe for use by beginners as a long-lasting premium tool, or for more experienced straight shavers who will appreciate its fine design and performance. The straight razor is a Japanese shaving equipment and unlike traditional American razors, they are usable on both sides. Most western razors are usable on just one side. The Japanese Kamisori, or straight razors created with the perfect balance of blade and body. The A. P. Donovan is the perfect mix of Japanese ideology with American creation for a truly unique shaving experience. Most of the famous Japanese brands of straight razors such as the Feather and Iwasaki brands last a lifetime. But the A. P. Donovan will not disappoint with its carefully crafted design and performance to deliver the smoothest and closest shave. A brand which may not be associated with the native roots of the straight razor, delivers with its durability, performance and design. One of the biggest disadvantages of the A. P. Donovan straight razor is its blade. Although created from premium grade steel, it is dull in comparison to others such as Feather blades. Given the style, price and build material of A. P. Donovan, its quality control assurance department can deliver better products for better user experience. Yet another straight razor by Feather, the DX Japanese Straight Handle Razor. The dominance of Feather in the straight razor industry can be understood by the presence of three products in the top five. As the others we mentioned by Feather, the DX comes with its fine quality heat-resistant gum handle with a body made of stainless steel – rust and corrosion free. The DX Japanese Straight Handle Razor also uses the innovative replaceable blade technology of Feather. It takes care of the burden of maintaining and sharpening the blade with just a simple like for like replacement. You can choose between any of the blades by the Feather series according to your individual skin and beard type. Like the others we mentioned by Feather, it too is very similar in every aspect of quality and performance. It comes down to which type of handle you prefer to use, a stiff, firm handle, or something more flexible to grip. With your preference, Feather has every choice available from its straight handle and the folding handle straight razors. Feather delivers once again, with a straight razor that is worth every cent! The Feather DX Straight Handle Replaceable Blade Razor is uniquely treated with chemicals for delivering a smoother shave. With every straight razor, the shaving is a lot of extra work. You must be ready to strop the blade daily, routinely hone it for perfection and generally very high maintenance. But the replaceable blade technology eliminates all that with a simple replacement blade. So, straight shaving will not be a turnoff for those who are not willing to work so hard to maintain it. The unique curved handle gives ultimate control for precision and perfection. You can not only shave, but carve an art on your face with a premium straight shaving razor. Most people who try Japanese straight razors, stick to it. And many of whom that use a Feather as their first straight razor, are reluctant to try any other brand. You will be annoyed that the replacement blade does not support any other blade than the Feather series, but it guarantees satisfaction. Whether you have heard about the Japanese straight shaving razors for the first time or not, this review must have given you an idea of the performance they deliver. Given that you are convinced of using one, it is important that you choose a straight razor which is of the best quality. Whether you try one of the five we reviewed or not, make sure to consider some very important factors before buying one. The Shaving Performance: Exceptional or Ordinary? One of the most important point of consideration is performance. Straight razors are the tool of choice for professional barbers all over the world. One of the reasons why the blade is so sharp is because it used by barbers and professionals. The technique of shaving is crucial to master to avoid injuries. The truly exceptional performance depends on the material and craftsmanship of a razor. If you do not get a quality product, then do not expect a quality shave. The finest shaving performance can be guaranteed from a fine quality straight razor. As mentioned, the craftsmanship is a major deciding factor of the performance. The Japanese razor is the result of hundreds of ears of Japanese craft documented in its history. Any brand can deliver premium products, with just the reputation of it. But the intricacy in its craftsmanship and elegance is something which is a trademark of Japanese straight razors. So, stick with a premium quality, Japanese brand! It is important to research the company that produces the razor that you choose. Given that a respectable Japanese manufacturer produces it, you will be rest assured of its quality. But it is notable that there are many copycats – so be wary! In the hunt of high-quality razors, you will find the rest which can be an imitation. The brand value is crucial and is linked directly to the genuineness of the product. Heavyweights such as Feather should be your ideal manufacturer to avoid disappointment. You may wonder, why Japanese straight razors are so expensive. You must remember that the highest quality materials go into the production of a tool built to last a lifetime. Considering the recurring cost of disposable razors, you will see the value for money of an expensive straight razor. However, you must still pay attention to the prices on offer by companies. Things like handcrafted designs also factor in the pricing, which is not a concern for performance. Don’t just blindly spend money on a Japanese product, judge its practicality, performance and your exact needs before investing. All straight razors come with a steep learning curve. Switching to a straight razor after years of using a standard razor, is a tough task. But, with time, they become very easy to use. You will slowly pick up the many techniques and what works for you. Effort also goes into sharpening the blades and maintaining them properly for long term use. It is important you like the handle as this directly influences your shaving style and technique. There are many options such as straight handles, firm ones, curved and flexible handles, etc. Pick one that you are comfortable with to make your shaving easier. The blade of the straight razor is the razor! It is extremely important to consider what type of blade material is used in making the razor. Regardless of how sharp or easy to use or attractive the design, if the material is not good quality then you will suffer in sharpening in maintaining it. You must make sure that it is long-lasting, corrosion free, and has all accessories for proper stropping. The majority of straight razors come unsharpened and without the tools needed to sharpen it. So, you must be prepared for it, or else you can choose a replaceable blade razor for hassle free shaving. Are you converting to a straight razor today? Don’t worry, the pressure is not on you! If you are looking for superior shaving performance then you must steer away from the traditional razors and opt for a straight shaving razor. Savvy shavers will fancy the idea and everyday shavers may be scared away, but given that you choose the right Japanese straight razor – your satisfaction is guaranteed! 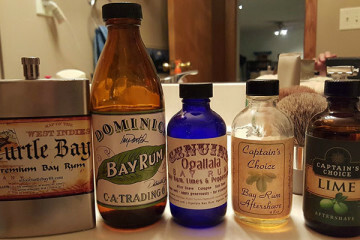 You will get extremely close shaves using a straight razor and given you have read through the reviews of the top five in this article, you will know how to pick a good one. Don’t compromise quality for price and know the value for money of your product. Japanese razors are elegant with their sleek, super-carved look, and once you use one, you will enjoy shaving more than you ever knew you could. Pick your razor today and share your thoughts and feedback of becoming a straight shaver!